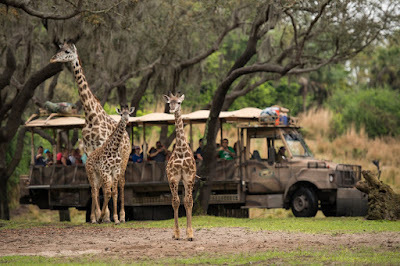 Guests at Disney’s Animal Kingdom at Walt Disney World Resort in Lake Buena Vista, Florida, may be able to spot a new addition on the Kilimanjaro Safaris savanna. A 2-month-old male Masai giraffe named Jabari has officially joined the giraffe herd. Jabari, which means “brave one” in Swahili, is a bold, curious and courageous calf and his name celebrates his spirit. Standing seven feet tall, Jabari has spent the past two months bonding with his mom, Mara, in a backstage habitat. True to his name, Jabari has quickly reached all his key developmental milestones, so on March 12, 2019, he was reintroduced to the savanna and his tower – otherwise known as a group of giraffe. 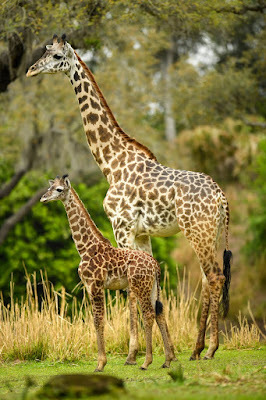 Jabari has several special distinctions; he is the first giraffe calf to be born on the savanna at Disney’s Animal Kingdom, and he has a special heart-shaped spot on his neck.